← Congratulations Class of 2011! In preparation for our upcoming Silver Anniversary, the May-June 2011 issue of the UR periodical Rochester Review features a Letter to the Editor from SBAI Director Honey Meconi. Next year marks the 25th anniversary of the Susan B. Anthony Institute for Gender and Women’s Studies at the University. In preparation for the yearlong series of events to mark this milestone, we are interested in hearing from alumnae (and alumni!) 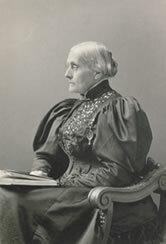 of any traditions at the University connected with Susan B. Anthony, especially from the years before 1986. Please send any memories or thoughts to sbai@rochester.edu. Whether you have a story to share from decades past or one from a year or two ago, we would love to hear it! For more 25th Anniversary news and events, continue checking in here or on our events page. This entry was posted in Announcements, SBAI Events and tagged #25th, #alumnae. Bookmark the permalink.